Giving Thanks and Free Gift for the Produce Like a Pro Community! Hi Friends, I hope you’re all doing marvellous well! I want you to know that I am thankful for all of you. Together you have built the best pro audio community on the internet. I’m so thankful for everyone who takes time out of their day to leave positive and helpful comments on the videos. This is not only a huge vote of confidence it helps so many people! So many of you are downloading the multitracks, mixing the songs, and interacting with each other, sharing your tips and tricks. This is what makes this community so great, so marvellous and I’m so thankful that you are a big part of it. I’ve prepared a special gift for you, to show you how much I appreciate you! You can download a multitrack session (for free) that is usually ONLY available to members of PLAP Academy! 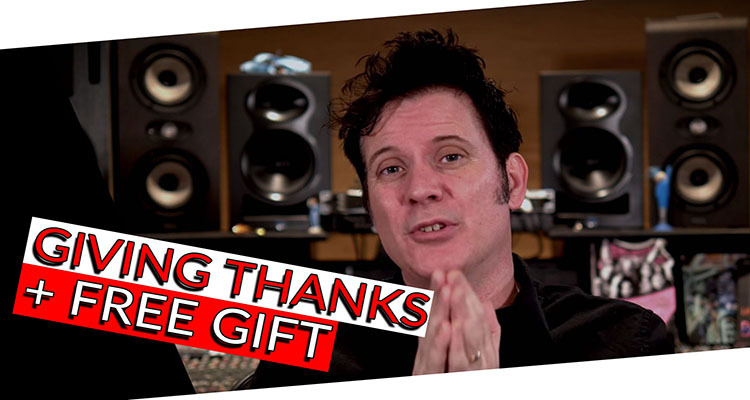 I want to give thanks to those that have come before and laid the groundwork for what we do on YouTube such as Graham Cochrane at Recording Revolution; a man who gets so many people started making music! My good friend and master guitarist, Tim Pierce, whose insight into guitar playing is an inspiration! Rick Beato the closest thing we have to a musical genius on the Web, a guy who I have known for over 15 years and recorded with, a true talent! Next, our friend and ‘Metal Shock Jock’ Mr. Glenn Fricker, whose Fearless Gear Reviews are hard hitting and honest! Of course no list could be complete without world class mixer Dave Pensado; a pioneer, whose interviewing style is the most relaxed and mature out there! Special thanks for me goes to both Marty Schwartz and Scott Devine who created amazing communities of people who help many others! Their ground work is unbelievable and I highly recommend you check out their channels! My gift for you is a Free set of Multi Tracks of the Artist Chris Sahlin’s song. ‘A Hundred Lousy Love Songs’ from the Produce Like A Pro Academy! Every month in the Academy we give out a free Multitrack (sometimes two!) That multi track comes with a mix breakdown video and every week we do mix critiques of your mixes! The Forum is incredible and people help each other immensely by sharing their own tips and tricks! So please download the Free Multitracks, mix the song, and use it in your resume! All we ask is that you name check Produce Like A Pro and of course the Artist, Chris Sahlin! I wanted to give you a head start on our Black Friday Insanity Deals since you’re a member of our amazing community!